Vaccines are something most of us take for granted, but as these maps compiled by the Council on Foreign Relations show, we're still a long way from ensuring everyone's safe from some of the world's most dreaded — and preventable — diseases. The CFR is a nonpartisan think tank that's been tracking news mentions of various outbreaks since the fall of 2008. 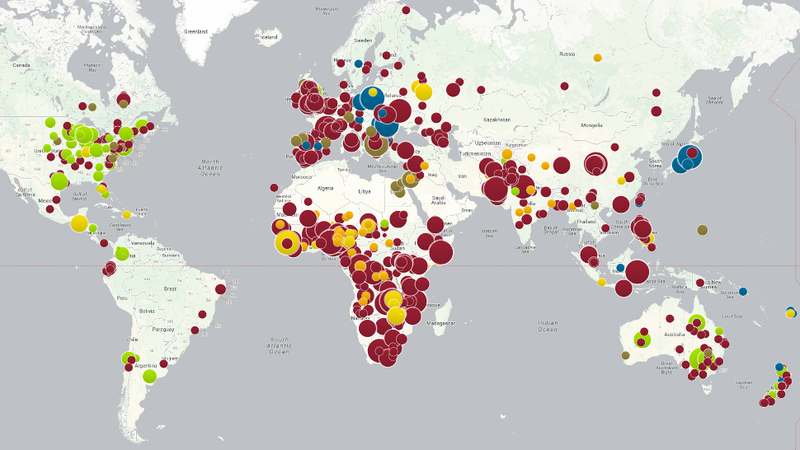 Its new interactive map visually plots global outbreaks of measles, mumps, whooping cough, polio, rubella, and other diseases that are easily preventable by inexpensive and effective vaccines. The map is meant to promote awareness of a global health problem that is easily preventable. Let's zoom in a bit. This first map shows North America from 2008 to 2014. Yikes. You'll want to show these maps to your anti-vaxxer friends. Estimates from WHO suggest that, in 2008, about 16 million cases of pertussis occurred worldwide, 95% of which were in developing countries, and that about 195 000 children died from the disease...In 2008, about 82% of all infants worldwide received 3 doses of pertussis vaccine. WHO estimates that, in 2008, global vaccination against pertussis averted about 687 000 deaths. Measles is one of the leading causes of death among young children even though a safe and cost-effective vaccine is available. In 2011, there were 158 000 measles deaths globally – about 430 deaths every day or 18 deaths every hour. More than 95% of measles deaths occur in low-income countries with weak health infrastructures. Measles vaccination resulted in a 71% drop in measles deaths between 2000 and 2011 worldwide. In 2011, about 84% of the world's children received one dose of measles vaccine by their first birthday through routine health services – up from 72% in 2000. Measles and polio are prominent in Africa, with mumps an issue in Egypt. Owing to the civil war in Syria and the disruption of health care, polio is making a comeback. Australia and New Zealand are not immune to the problem. Again, measles is a problem elsewhere in the world. And it looks like rubella is an issue in Japan. Whoa, Europe looks surprisingly bad with a little bit of everything.